Aphids are relentless, shaped like pears, and are the number one enemy of roses. These irritating little pests are often called plant lice; white flies; blackflies; or greenflies. Generally infestations are minor and damage from them is minimal. 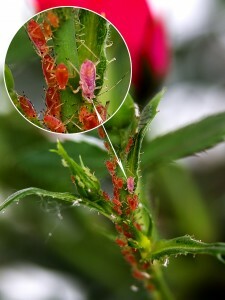 In these cases, ridding rose bushes of the parasite is relatively simple. Left uncontrolled aphids can colonize on the bushes starting in the spring and by autumn will have ventured to all of the rose bushes. Certain species have the ability to overwinter on roses. It is important to inspect rose bushes on a regular basis. Experts vary on how often this should be ranging from weekly to daily. It is the first line of defense against and the first step to controlling aphid infestations. They usually hang out in groups; however, it is not unusual to see them individually. Curling, and/or stunted leaves may be found. While feeding, aphids may cause misshapen fruit and blooms to form. Bacteria tumors or galls may develop on leaves and roots. Honeydew which is waste remains may be found on stems and leaves. This resembles a sugary type liquid. Black leaves and branches may appear which is mold and develops from the honeydew. Roses may present infestations of other insects which are attracted to the honeydew. Diatomaceous earth is often used as an effective insecticide for many species of pests and parasites including aphids. DE resembles a fine talc powder; however, looking through a microscope reveals tiny particles with razor sharp edges. Aphids are anatomically soft bodied and extremely vulnerable to the dustings of these minute diatoms. The pointed portions of the particles puncture the parasite’s body and wicks the moisture from it. This cause severe dehydration and ultimately death. There are many insecticides available on the market to battle hostile aphid takeovers. Most of these are extremely toxic and can present dangers to humans and animals, especially aquatic species such as fish and frogs. Releasing Ladybugs into the environment is another excellent solution and it is natural. This method while environmentally pleasant is not wallet friendly. Diatomaceous earth can effectively rescue rose bushes from aphid infestations and is an extremely economical method. Diatoms are the remains left by aquatic plant life millions of years ago. Diatomaceous Earth Online offers only food grade DE which has been desiccated in the sun. Our Diatomaceous Earth is never artificially dried and we do not add any additional chemicals. We provid a number of different milled sizes each of which is respective of its purpose. Our aerosol can version is only one of the products we offer which would be suitable for dusting roses to effectively eliminate a pesky aphid infestation. The International CODEX standard states that Diatomaceous Earth must contain no more than 0.1% silica in order to be considered food grade. Our DE contains no traceable amount of silica.